There is a scene late in Sympathy for Lady Vengeance (2005), the last entry in Chan-wook Park’s searing and unforgettable trilogy of revenge films, in which the “hero” has finally succeeded in destroying the preternaturally evil predator that is the source of all her pain and anger and sadness. And she stands there as his ravaged body is laid to rest forever in a grave at her feet, the camera slowly closing in on her face. A tentative smile emerges, a glimmer of minimal redemption; and yet there are tears in her eyes that speak a deeper truth — that of a life barred from happiness, of a soul irredeemable. She is the avatar of all the abused children in the film, and of those parents whose anger seeks a target — anything outside of the deep wounds of memory — that it can never fully obliterate. In this film, as in its predecessors (2002’s Sympathy for Mr. Vengeance and 2003’s Oldboy) writer-director Park stares revenge unblinkingly in the face and depicts its violence and tragedy with a bleak and consuming determination. The protagonists of these twisted tales are shattered individuals whose sole purpose is to seek some kind of meaning in one last act of vengeance; whose lives are nothing but this overwhelming and intractable desire. The last film in the series carries the greatest emotional resonance, as we see the innocence of children and the protective safety of motherhood violated by the worst kind of terror. The “hero” of the story relentlessly persists in the dark shadow of this bleakness. She must. And in her persistence, with her power, some kind of redemption can be found, despite the frightening depths she goes to in order to find it. In her deranged pursuit of justice, we hear the primal scream of our anger at the life-crushing crimes perpetrated on the innocent of the world; of the scars that can never fully heal. And we feel the protagonist’s pain; in the void that is her soul, we see a tiny flame of goodness and hope. Its presence remains invaluable. We may be haunted by the terrible evil in the world, but this lost character, crying in the street as the film ends, haunts us even more than the choking darkness that tried to destroy her, but could not. 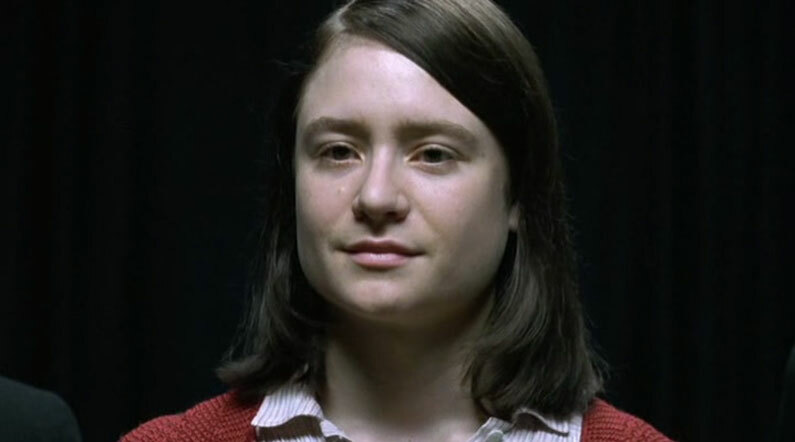 Hope in circumstances where it is threatened with extinction; that is the underlying principle of another film from 2005, Marc Rothemund’s Sophie Scholl. This is no fantasy. Instead, it is a true story of a life lived under the tyranny of ascending evil. It takes place in the streets and prisons of Germany in early 1943; violence is not seen but rather heard in air raid sirens and the echo of bombs dropping; and in imagining the continuing destruction of Europe. We follow Sophie Scholl in her 21st year; her last. She was a member of the small underground resistance group, the White Rose. The organization produced pamphlets that tried to educate German citizens about the ominous nature of Hitler and National Socialism; how the man and the movement can and must be stopped. To do this required the almost impossible task of standing up for principle against evil at its crushing and oppressive centre, where one’s voice remains mostly unheard, considered ludicrous, or distorted beyond recognition. And ultimately silenced. That is Scholl’s fate. It’s an extraordinary film: simple, stark, sad, and powerfully inspiring. At its heart is not only a young woman who faces death with dignity and certainty, but also a fundamental lesson about the responsibility of a life of conscience and activism; of the pursuit of goodness in the midst of evil. If you want to understand the full tragedy of those words you must realize what they meant: Christ saw that his whole life, devoted to the truth according to his best conviction, had been a terrible illusion. He had lived it to the full absolutely sincerely, he had made his honest experiment ... On the cross his mission deserted him. But because he had lived so fully and devotedly he won through to the Resurrection body. a sixteenth-century decent horse dealer whose two horses are mistreated while in the possession of the arrogant Junker von Tronka. Kohlhaas first patiently seeks justice in the courts; however, when this fails, he gathers an armed band, hires militia, destroys the Junker’s castle, burns down whole cities, and involves the whole of Eastern Germany in a civil war — all because he does not want to compromise his demand for recompense for his two famished horses. At the end, Kohlhaas is captured and beheaded, but accepts his punishment, since his claims against the Junker are also to be met in full, and the Junker will have to spend two years in prison. At the place of his execution, his two horses are presented to him, fully restored to health, and he dies completely satisfied, as justice is done. Zizek analyzes this story through the Lacanian prism of the “ethics of the Real,” with the horses as an ordinary object “elevated into the dignity of the Thing,” and of a singular Event (a crime) that changes the coordinates of existence itself. Kohlhass “sticks to his sense of civil virtue and justice to the end, whatever the cost.” The story is a cipher for the desire to reform the political landscape; a way to air fundamental grievances when it comes to authority, power and arrogance. Its extreme nature shows the bending of the oppressed to the distorted (violent) call of radical justice. At the end of this essay, I refer to C.G. Jung’s ideas of the self and individuation. A more thorough look at these psychological concepts can be found in my essay A Transverse Cut, which covers Jung’s 1932 seminar on the Kundalini Yoga.